I love grilled fresh sausages, done directly on the grates or even on a cedar plank. 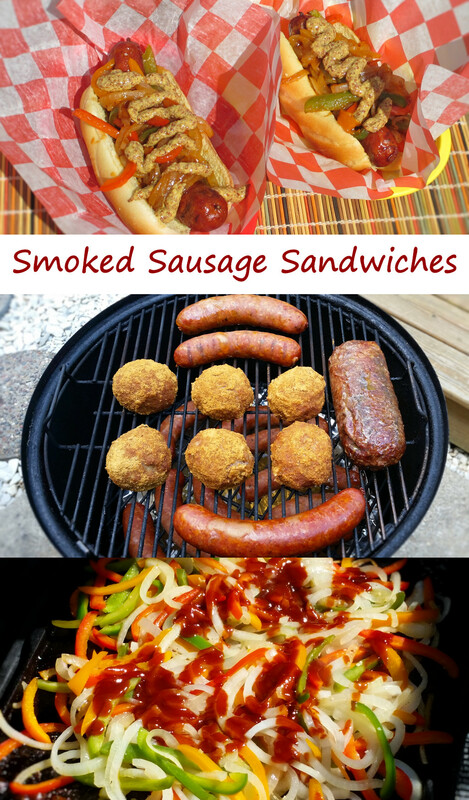 This time, I decided to smoke a few different kinds of fresh-made sausages low-and-slow. And boy, was I ever happy with the results. Great smoky flavor. Tender and juicy. Topped with the most incredible pepper and onion mix ever. These messy smoked sausage sandwiches were a great treat. If you don’t want to take the few hours it takes to smoke the sausages, you can grill them. But the topping, that you have to do. No short-cutting that. It’s not only great on sandwiches but also takes the ever-humble hot dog to new heights. Also try my smoked sausage sandwiches with beer-braised onions. The round things in the middle of my smoker? Those are smoked Scotch eggs. Fire up your smoker for cooking at 225 F. You can also cook the sausages on a gas or charcoal grill. Add the sausages and smoke for 2 hours or until the internal temperature is 155 F.
Assemble the sandwiches by adding the sausages to the buns and loading up on the topping. Add a bit of spicy mustard too, if desired. Note: I prefer to make this topping on a griddle insert on my grill since I'm already outside smoking the sausage. You can also make it in a large skillet on your stovetop. Add onions and peppers and saute until tender and golden brown, about 6 minutes. Add the garlic and saute for 3 minutes. Stir in the tomato paste, beer, and BBQ sauce. Cook for 5 minutes then reduce the heat to a simmer and cook another 10 minutes, stirring occasionally. The sauce should be nice and thick. If it gets too thick add a bit more beer or some water. As much as I love turkey around the holidays, it’s the dressing and gravy that I love the most. Dressing (specially this ciabatta and sausage dressing) has so many different flavors and textures and colors. Turkey? Meh… not so much. Not that the turkey is a bad thing, it’s just that I much prefer a plate with a lot of dressing and just a bit of turkey. I had never had a dressing that contained sausage until this one. I was blown away by just how much flavor the sage sausage adds. The ciabatta adds such wonderful texture and flavor too. There’s no question, this ciabatta and sausage dressing is just fantastic. Also try my more traditional Thanksgiving Day dressing. Melt 1 tablespoon of the butter in a large skillet over medium-high heat. Crumble in the sausage and cook until browned. Remove to a paper towel-lined plate to drain. Add remaining butter to the skillet and melt. Add the carrot, onion and celery and saute until starting to soften. Place the sausage, cooked vegetables, stock, oil, parsley, rosemary sage and bread into a large bowl and stir. Pour mixture into a 9" x 13" baking dish and spread out evenly. Bake 30-35 minutes or until golden brown and hot. Serve garnished with more parsley if desired. I made a lot, and I do mean a lot, of beer can chickens on my Char-Broil Big Easy last weekend. So, I had a good amount of chicken on hand. That got me to thinking beer can chicken jambalaya. 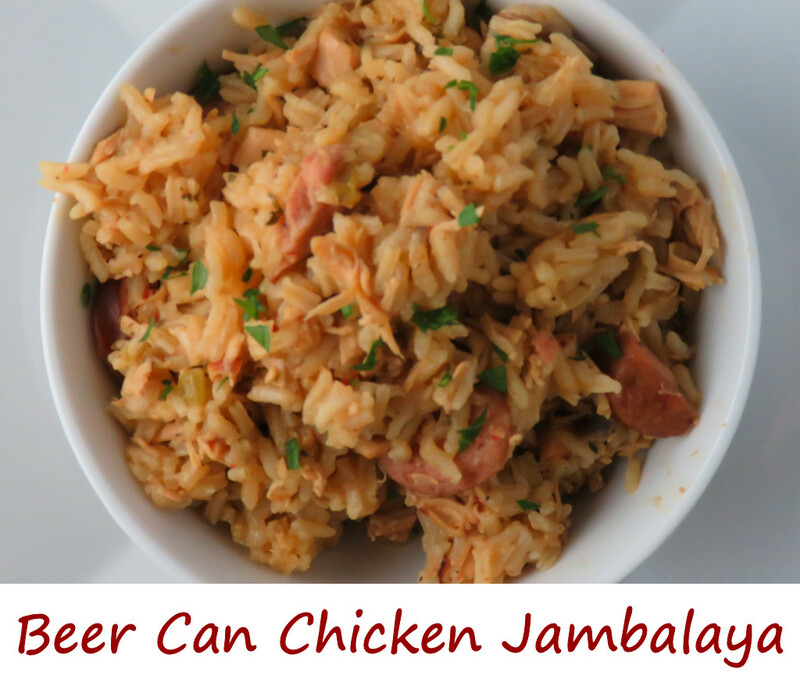 I took the classic jambalaya recipe from Chef John Folse and used my tender, incredibly flavorful beer can chicken instead of browned fresh chicken. There’s no loser in this beer can chicken jambalaya, but for me the winner is the rice (well, and me for getting to eat it). It absorbs flavors from the vegetables and meats and broth and spices and turns out just flat-out incredible. You can add shrimp to this jambalaya if you want, but I prefer mine without it. It’s hard to re-heat shrimp leftovers without them becoming way too tough. This recipe makes a big, big batch. Since there’s only two of us I was guaranteed to have leftovers and then some. Heat oil in a very large (7 quart or larger) Dutch oven. Add the sausage and brown lightly on all sides. Remove. Add the onion, celery, and bell pepper. Saute for 5 minutes. Add the stock. Bring to a boil and reduce to a simmer and continue simmering for 15 minutes. Add the chicken, reserved smoked sausage, mushrooms, green onions, parsley, salt, cayenne pepper and hot sauce. Cover and simmer another 15 minutes. Add the rice, reduce heat to low, cover and cook for 45 minutes or until the rice is tender, stirring every 15 minutes.